China is weighing subsidies for couples who have a second child to help increase the birthrate after authorities scrapped a decades-old one-child policy in 2015, official media reported. The government is considering measures such as “birth rewards and subsidies” to help encourage more people to have another child, Wang Peian, vice-minister of the National Health and Family Planning Commission, said at a conference on Saturday, according to a report Tuesday by the state-run China Daily. Such incentives, if adopted, would represent a fundamental shift in the Communist Party’s approach to family planning, from limiting births to encouraging them. After decades of penalizing many couples who had more than one child, now the world’s second-largest economy, which has gained for decades from having an abundant young workforce, is facing a hangover of its one-child policy implemented in late 1970s. Allowing all couples to have two children still falls short of reversing a trend that threatens to impose a drag on economic growth. And a limited baby boom could still be dampened by the rising costs of child-rearing. Wang said that affordability has become a constraint on Chinese families’ decisions to have a second child, according to China Daily. Wang’s comments are in line with the advice from one of the nation’s top demographers. Policy makers should use public services — including kindergartens, schools and child care — to lower costs and encourage cash-squeezed parents to have more children, Cai Fang, vice president of the Chinese Academy of Social Sciences in Beijing and a member of the Standing Committee of the National People’s Congress, recently told Bloomberg News in an interview. Wang said that such a “baby bonus” policy would not be easy because it should be applied evenly nationwide, China Daily reported. The population authority alone can’t handle such a plan as it requires consensus and cooperation among all authorities, Wang said. Government subsidies may not be a panacea. They had limited success in countries such as Singapore because people tend to have fewer children when they’re wealthier and more educated, according to Chen Xingdong, chief China economist at BNP Paribas SA in Beijing. Births reached 17.86 million last year, a 1.3-million increase from 2015, official statistics show. The policy would lead to about 17 million additional births by 2020, and add 30 million young workers by 2050, the family planning commission said in late 2015. The larger labor supply would boost the economy’s potential growth rate by 0.5 percentage point, it said. The working-age population has been shrinking as a result of aging and low birth rates, draining the labor supply. About one in three Chinese will be older than 60 by 2050, compared with about one in seven now, posing challenges to the social welfare system. As of Feb. 22, flight searches to the U.S. from other countries had declined 17 percent since Trump’s inauguration, compared to Barack Obama’s final weeks in office, Hopper said. There was a mere 1.8 percent decline over a similar time period in 2016, and a 5 percent decline over a similar period in 2015. According to the Times, Cheapflights.com saw international searches for flights to the U.S. drop 38 percentin the three days after Trump signed the executive order. With options ranging from travel rewards to cash back and sign-on bonuses, there are many options, but not all are the right choice for you. Nick Clements, co-Founder of MagnifyMoney.com, said the question isn’t what the best credit card is, but what the best credit card is for the consumer and what they plan to use it for. 1. Those trying to pay off debt: For those who already have debt and need to pay it off quickly, Clements recommends looking for a balance transfer credit card deal that has no transfer fee and low to zero interest. He said other options include a credit union with no fee and no interest, but you have to make sure you pay it off before the interest hits. 2. You want to make a big purchase and need to finance it: If your water heater breaks or you’re slammed with an expensive purchase you can’t afford, be wary of financing anything at the checkout counter, Clements says. When the hardware store offers you a card with 0% on your purchase for 12 months, don’t skip the fine print, Clements said. “Most retail offerings have what’s called deferred interest, so if they give you 0% for 9 to12 months and if you don’t pay off at the end of that time you get hit with interest retroactively from the date of the purchase,” he said. And that can be a lot of money. 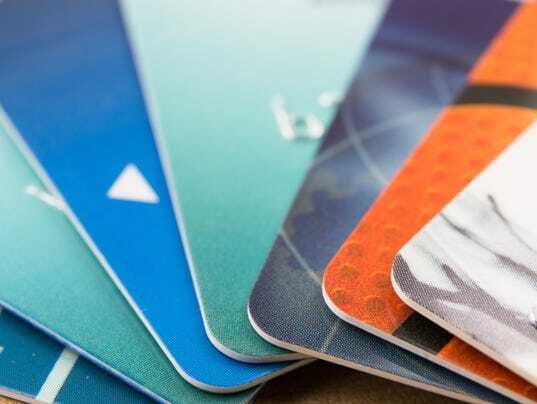 He points to credit cards that offer 0% interest on purchases for a set period of time and no retroactive interest if you don’t pay off the entire purchase by the end of that period, such as the introductory offer from the CITI Simplicity card. For those looking for cash back deals, Clements pointed to CITI Double Cash and Fidelity Rewards Visa. The CITI card offers 1% when you make a purchase and 1% when you pay your bill, while Fidelity offers 2% cash back on all purchases. The only catch? You have to pay your statement in full and on time each month. Clements said for those with a travel itch, the Chase Sapphire Preferred Card can get consumers 2 points for every dollar spent in restaurants and on travel. Card holders can redeem the points for travel in the Chase portal. Clement said if you are dedicated to a particular airline like Delta or American Airlines, an airline credit card might work for you. He points to those who do a lot of traveling with a particular airline and would like to increase their miles. “If you know during the year, you’ll earn 70,000 flying for business, and at 100,000 you get a better flight, an airline credit card] is a good way to top up,” he said. A secured credit card is mainly for young people looking for their first credit card or those looking to restart their financial life and build new credit. Emergency Medical Services across the country face the challenge of people who call for ambulance service again and again, when there is not a real EMS needed. Most South Georgia county EMS services tell us they have a certain number of people they call “Frequent Flyers,” people who call 911 and request an ambulance when it’s not a real emergency. Now, WALB’s Jim Wallace examines the high cost those free rides could put on a community. Emergency officials say they get these calls almost daily calls for emergency medical services, that might not be a real emergency. “It’s a risk anytime you get on the road with an emergency vehicle, because you are running emergency mode,” said Albany Fire Department Fire Chief Ron Rowe. Dispatcher: 911, what is your emergency? What’s the problem? Caller 1: I got a, I stepped on a nail and my feet still swelling up. Caller 2: I’m having trouble with my throat and my nose. Caller 3: I don’t know. I been having a lot of heartburn. “We’re going to go, regardless of what the call comes in as,” said Dougherty County EMS Director Greg Rowe. Emergency services have to treat every call as the real thing, but on average Dougherty County officials say they get one “frequent flyer” per day. Officials describe a frequent flyer as someone who calls for an ambulance trip to the emergency room, when a doctor visit is more appropriate. But emergency officials say the high rate of poverty in Albany explains why many frequent flyers may just want a free ride. EMS Director Greg Rowe estimates each ambulance run costs the county about $191. While the frequent flyer’s insurance often can not pay back that cost, there is a much more costly danger to the community in these unnecessary calls. The good news is that for the last three years, Dougherty County has managed to stay under-budget despite the cost. “Anytime a truck goes out, that pretty much leaves that territory open,” said Greg Rowe. When one county paramedic crew is servicing a frequent flyer, if a real medical emergency like a car crash or a stroke occurs, it has to be served by the nearest station’s ambulance. “It is going to add 3 to 6 minutes to that call,” said Greg Rowe. Which could be the difference between life and death. A cost of unnecessary ambulance service to frequent flyers that no one wants to pay. But what officials call the future of EMS service could be an answer to this problem. Computerized Medical services for 911 calls that are not emergency needs. A crew with a computerized link to a remote physician to examine the patient on line. “That physician can basically sit right there and guide you with that tool. And he can see exactly what he needs to see, and guides direction at that point. That would reduce a lot of hospital visits,” said Greg Rowe. Computerized Doctor checks could be the future of EMS, but for now ambulances continue to roll each time someone calls 911. Even if paramedics know it could be a frequent flyer calling again. First responders want you to remember many calls that don’t sound like medical emergency could be. They can’t be sure without being dispatched to the scene. Every January for the past 10 years, my husband has taken a guys’ trip to Alabama for a charity event, using his rewards points for his flights. Since the plane ticket is about half the total expense of the trip, using points makes the vacation more affordable. In fact, over the past decade, he’s saved at least $5,000 on airfare. Since we pay off the balance of the card every single month, these rewards are essentially free (except for card’s annual fee). So we are net ahead — winning the rewards card game. Do you have a great credit score? If your credit score is above 700, you are generally considered to be in the “good” range in terms of credit, which means lenders will offer you better credit card interest rates. With an excellent credit score, 800 or above, you are shopping for variable rates between 12.46% – 26%, according to Creditcards.com. If your credit score is poor, interest rates in the teens are generally not available to you unless it’s an introductory rate. You are looking at interest rates well over 20%, according to CreditSesame. So if you don’t always pay off your whole balance each month, the rewards may cost you more than they are worth. In other words, you lose. Focus on increasing your credit score first. Rewards pay off when you pay off your full credit card balance religiously every month. This way, you maximize your rewards without any out-of-pocket cost. If you decide a rewards card is for you, how do you determine which one to get? People gather to protest against President Donald Trump’s travel ban in New York City, U.S., February 1, 2017. A federal appeals court on Monday rejected a U.S. Department of Justice request to place on hold an appeal over President Donald Trump’s travel ban on people from seven majority-Muslim countries. The order from the 9th U.S. Circuit Court of Appeals could increase pressure on the Trump administration to clarify its intentions regarding the controversial executive order. The 9th Circuit suspended Trump’s travel ban earlier this month while litigation over the measure proceeds. Trump has said he will soon issue a new executive order that addresses concerns raised by the appeals court judges. The president’s Jan. 27 order caused chaos at airports around the world as visa holders heading to the United States were pulled off planes or turned around upon arrival at U.S. airports. Americans were deeply divided over the measure, which was condemned by prominent U.S. companies and allies and challenged in court by the state of Washington. The 9th Circuit had directed the Justice Department to file a legal brief defending the travel ban later this week. Given Trump’s intention to issue a new order, however, the Justice Department asked last week for the appeal to be placed on hold. In a response, the state of Washington said the Trump administration has said both that it would pursue an appeal, and that it would issue a new order. “Throughout these proceedings, there appears to have been a lack of communication between the Department of Justice and the White House,” the Washington attorney general’s office said in a court filing arguing that the 9th Circuit move forward now. Representatives for the Justice Department declined to comment. After stating that a new travel ban would be issued last week, a White House official said on Wednesday that a new order would come sometime this week. A reader: I was on a trip recently and wanted to make a purchase with my credit card. However, the store had a sign that said I needed to make a minimum purchase of $10 in order to use my credit card. I only use my cards when I travel but I have seen these signs before. Can merchants require a minimum purchase for credit card transactions? Why do they charge me a fee just to spend money with them? And why is it that I am charged a higher price for using my credit card at gas stations? Action Line: According to the agreements merchants sign with MasterCard and Visa, merchants are not allowed to place minimum amounts on using a credit card for purchases. Discover keeps its agreements private. American Express says its merchants cannot do anything to discriminate against card users so, in essence, merchants can’t require a minimum purchase with AMEX. Also, according to their service contracts, merchants are not supposed to charge a plain usage fee for using credit cards. Personally, I find this most often at small independent stores (like mom & pop stores) and my guess is they do that to cover their transaction costs. Restrictions about charging fees for using a debit card would vary by whatever agreements the merchants had with their bank. What can you do if a minimum amount is set or an extra fee is charged? The consumer has the right to inform the merchant that their policy is incorrect; refuse to shop at that merchant and/or call the number on the back of their card and report the merchant. However, merchants can charge a fee when it is a convenience fee. For example, you are paying your telephone or utility bill at the liquor store or sandwich shop – a service that the store offers, but is a business/service outside of that store’s routine practices. As for using credit cards at gas stations, most stations do charge one price for using your credit card and reward you with a lower price for using your debit card or paying with cash. There is nothing in the credit card service agreements prohibiting offering discounts for using cash while charging another price for using the credit card. CINCINNATI — You might think increasing a reward would help catch a killer. But that’s just not true, according to the former police chief who leads Greater Cincinnati Crime Stoppers. In fact, his organization says a larger reward could make police work harder. Gene Ferrara, Crime Stoppers chairman and former University of Cincinnati police chief, said there’s no evidence a larger reward helps. “We’re not in favor in something that’s unproven, even though it sounds kind of good on the surface that we should do that,” he told WCPO. “The drug boys can pay anybody $1,000. I mean, $1,000 is nothing for the street. So, this sense that someone’s going to come forward for $1,000 in a heinous crime where we have three or four people breaking into someone’s home and shooting the owner and killing a kid — there’s a lot of fear out there,” Smitherman said. In his letter, Ferrara countered that cases involving large rewards usually are solved because of solid police work — not the reward amount. Big rewards also can lead more people to send in bogus “tips” that aren’t helpful, Ferrara said, which just distracts detectives. “It’s an awkward position for us to be in because obviously our whole purpose is to catch bad guys,” Ferrara said. Smitherman said he hoped Crime Stoppers would reconsider. “There has been discussion about possibly starting another organization in order to resolve the matter,” he said. Cincinnati City Council’s Law and Public Safety Committee, which Smitherman leads, is expected to talk about the issue at 10 a.m. Monday at City Hall. The Iranian director Asghar Farhadi didn’t attend the Academy Awards tonight to accept the Oscar for his film The Salesman, which won in the category of Best Foreign Language Film. He canceled his plans to travel for the ceremony, he has said, because of “the unjust circumstances” created by US president Donald Trump’s executive order banning travel from several Muslim-majority countries, including Iran. The Bible speaks of certain people who were able to “walk with God” in close communion. It seems difficult to believe in the hectic modern world, where people run from one obligation to another at the expense of the most important things in their lives. How can a person incorporate faith into everyday life? And how can a person truly live the way God intends? Pastor Mark Biltz of El Shaddai Ministries, the man who discovered the “Blood Moons” phenomenon, lays out a program of total life reform in his newest book, “God’s Day Timer.” The key, he believes, is getting on the biblical calendar, “God’s calendar,” and observing the biblical feast days. “Our spiritual life is totally strengthened when we walk with God just as Enoch did, along with Noah, Abraham and David as they walked with God,” Biltz told WND. “In Amos 3:3 it asks, ‘If two can walk together unless they are in agreement.’ If we are to walk with God we must walk with Him in agreement. If I want to connect with someone in a different time zone, we need to be in agreement as to whose time zone we will choose. If you want to walk with God, you need to know when He goes on His walks! However, the importance of following the biblical calendar and becoming knowledgeable about the feasts goes beyond one’s spiritual life. Biltz argues the biblical feasts provide an entirely new way of understanding the Bible. “God ordained the feasts to be the appointed times when He would prophetically intersect human history,” he explained. Biltz argues knowledge of the biblical feasts allows one to appreciate the deeper patterns contained within the Bible and the full interconnectedness of God’s plan. Biltz also claims the feasts have critical prophetic and eschatological importance for the entire Christian world. “Messiah died on Passover, He was buried on the Feast of Unleavened Bread, He rose on the Feast of First Fruits and the Holy Spirit was poured out on the Feast of Shavuot known as Pentecost,” Biltz marveled. For that reason, Biltz urges anyone who believes the world is nearing the last days to immediately educate themselves on the biblical feasts. Pastor Biltz’s video presentation, “The Feasts of the Lord,” goes into more detail about each biblical feast, how it corresponds or will correspond with a major intervention by the Lord in human history and why Christians should be observing each one. In the end, Biltz says the biblical feasts are not just “dress rehearsals” for the major events in history. They are preparation for God’s Kingdom on Earth when Biltz says the whole world will follow the biblical law. And as part of that, all people will be observing the biblical feasts. “During the millennial reign, Jerusalem becomes the capital of the world and Jesus himself becomes the teacher of the Torah,” Biltz said. “We find from Zechariah 14 that on that day when the Lord stands on the Mount of Olives and it splits in two at His arrival, the Lord will be King over all the earth. In verses 16-19, three times it mentions that representatives from all nations have to come to Jerusalem to keep the Feast of Tabernacles, and if not they receive the plague and no rain. Many Christians may find the idea of keeping the biblical, or Jewish, feasts strange or at least tangential to their faith. But ultimately, Biltz argues, the the biblical feasts and the calendar are central. After all, if God doesn’t change, then neither do the specific celebrations He wants His people to observe. “If we truly believe God is the same yesterday, today and forever, we must acknowledge He would never change His calendar of divine appointments,” said Biltz. “God is not schizophrenic, saying His Divine appointments are good for 2,000 years, then done away with for 2,000 years, and then good again for the next 1,000 years. They are eternal and constant, just like He is.